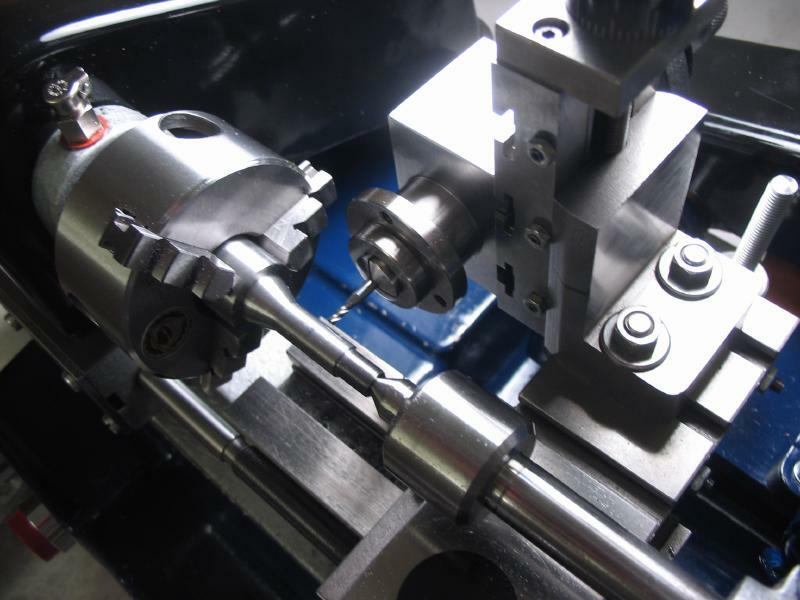 Slotting saws are available in various diameters, thicknesses and tooth counts. 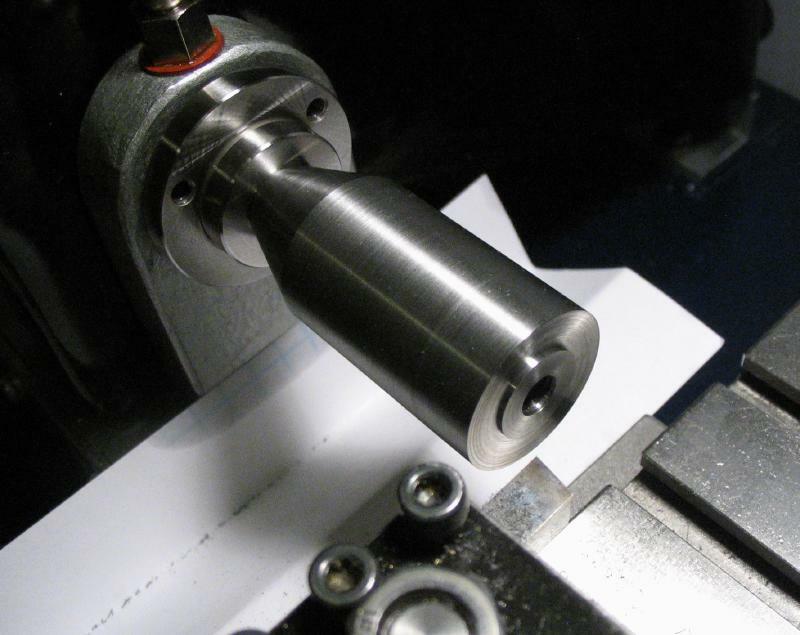 Mounting them on the lathe requires an arbor of some sort. 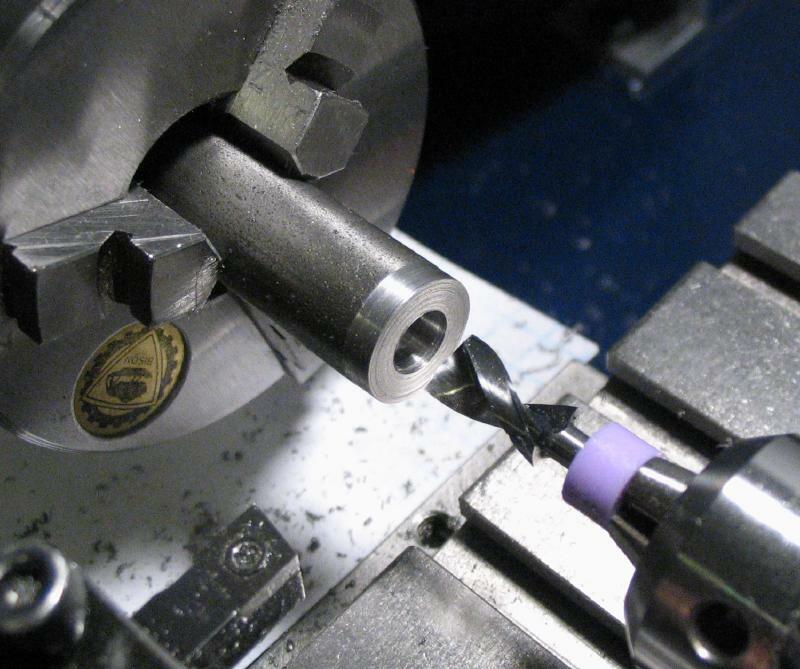 A purpose made arbor can help hold the saw true repeatably on the lathe. 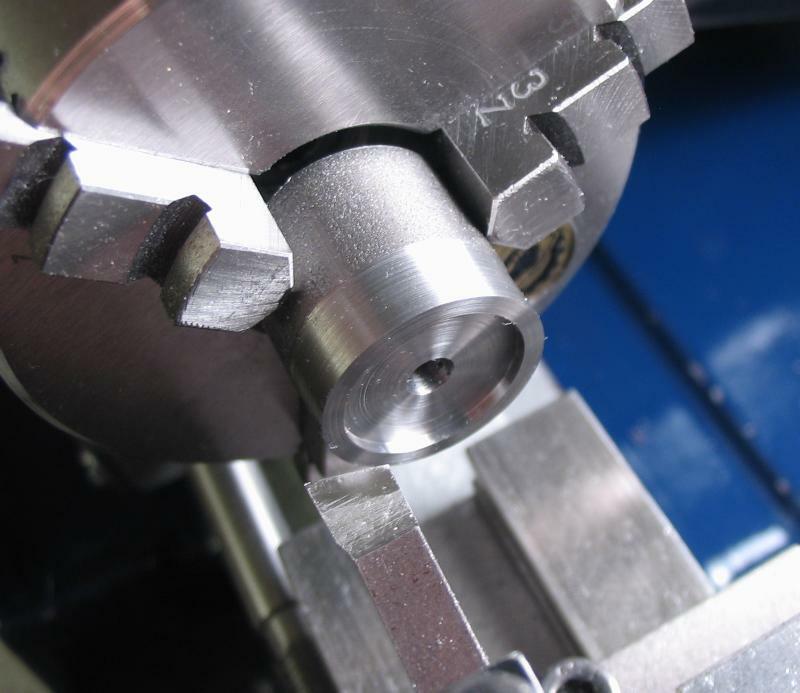 The first arbor shown is for a set of 1 inch diameter slitting saws that have a 1/4" bore and are in a variety of thicknesses. 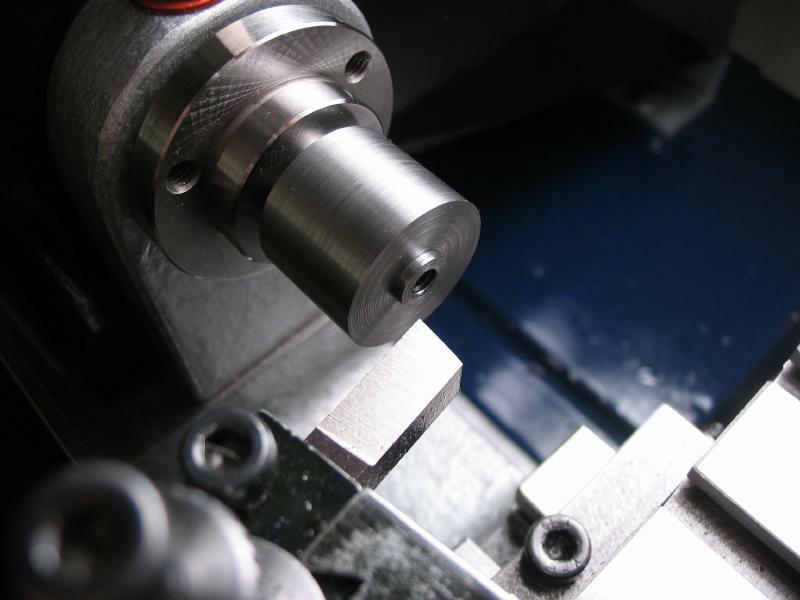 The arbor was made to fit the 1/4" bore and expose about 4mm of blade. 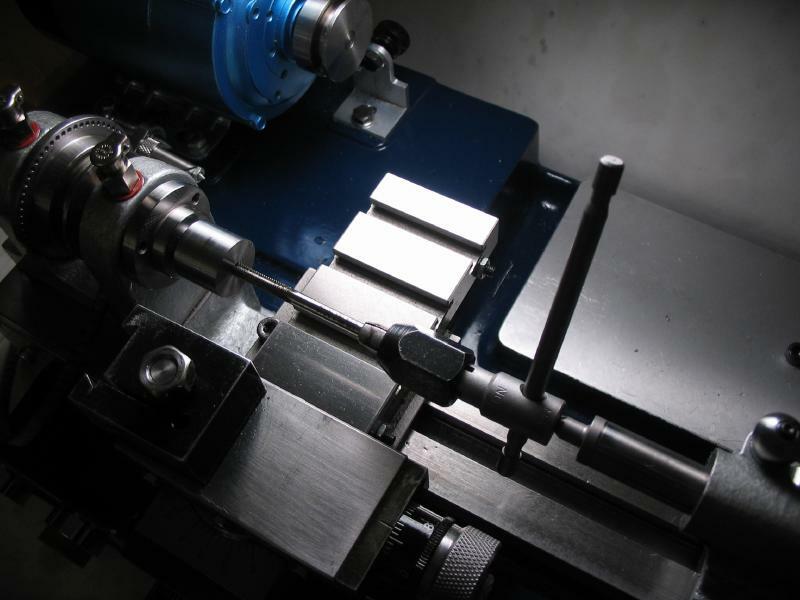 This arbor and saw combination would be suitable for slotting screwheads and for numerous slotting operations, that require only a relatively shallow slot. 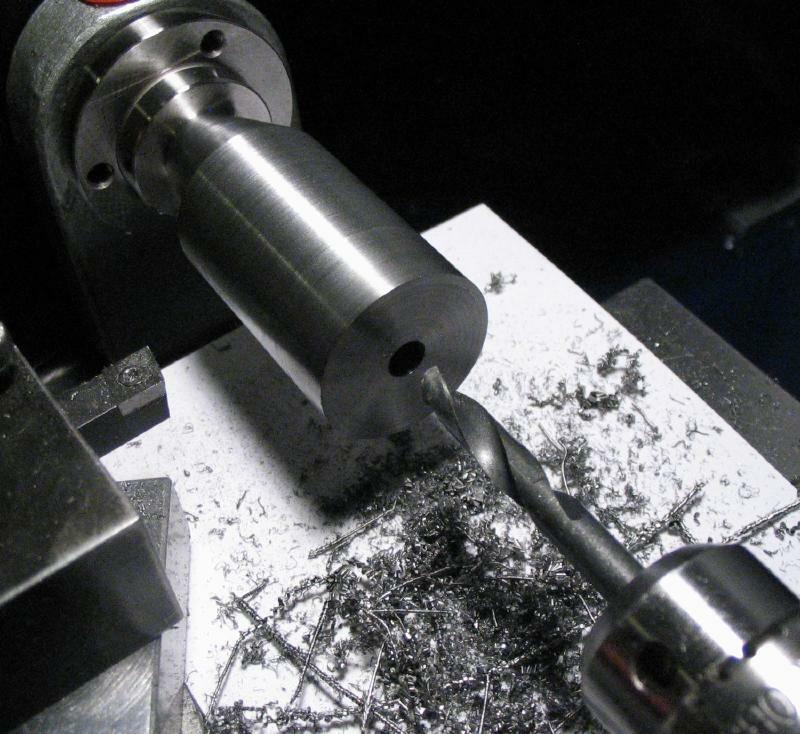 I started with a section of 3/4" steel rod (12L14) and faced and center drilled an end. 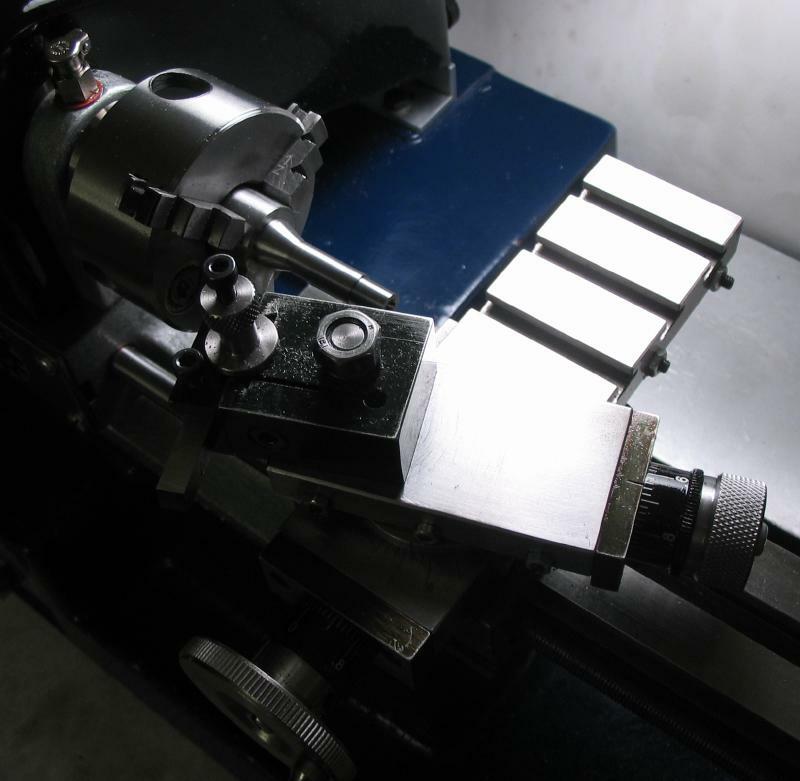 With tailstock support, the exposed portion of the arbor is turned down slightly, but not to the final diameter. 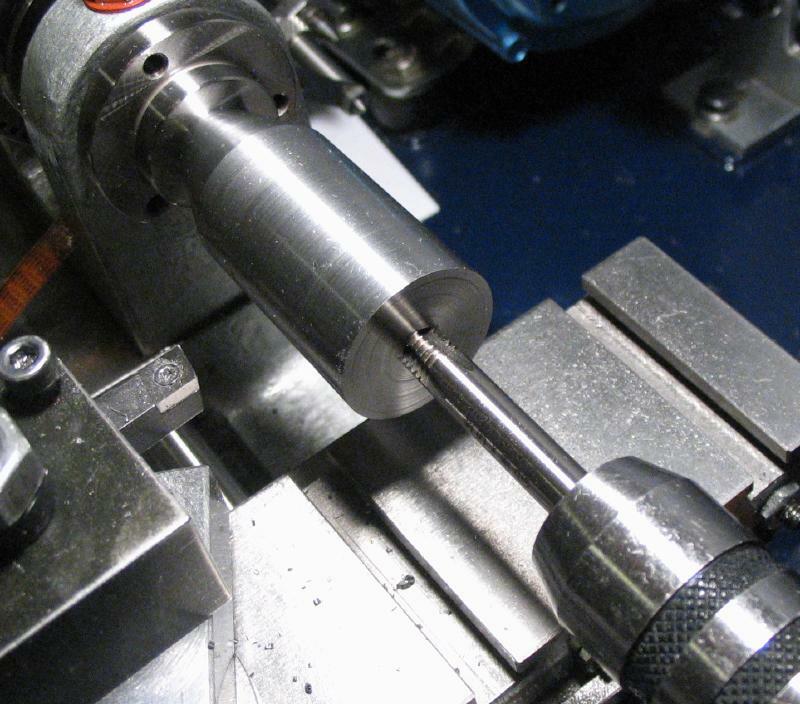 The rod is reversed and faced and center drilled. 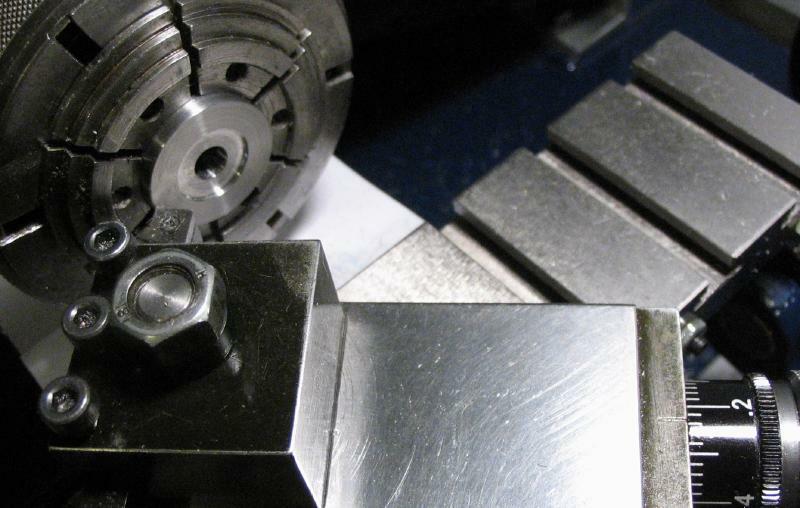 With tailstock center support, the 'collet' body of the arbor was turned to dimension. 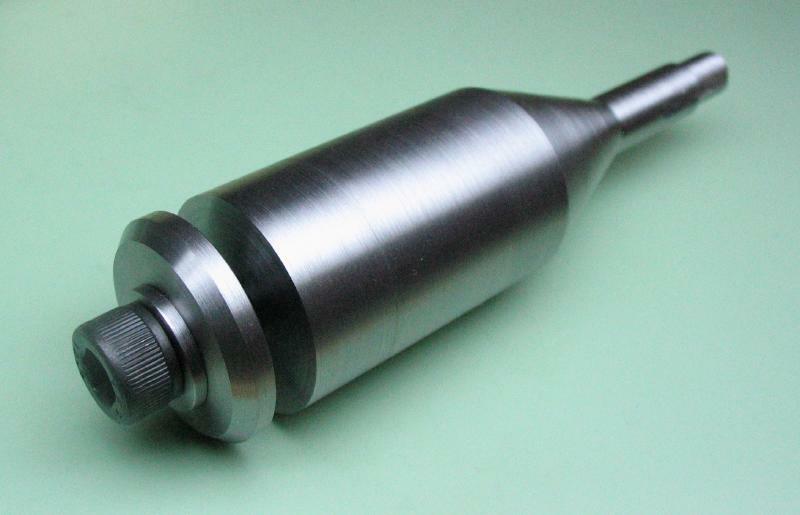 I simply used another collet as a guide for measurements. 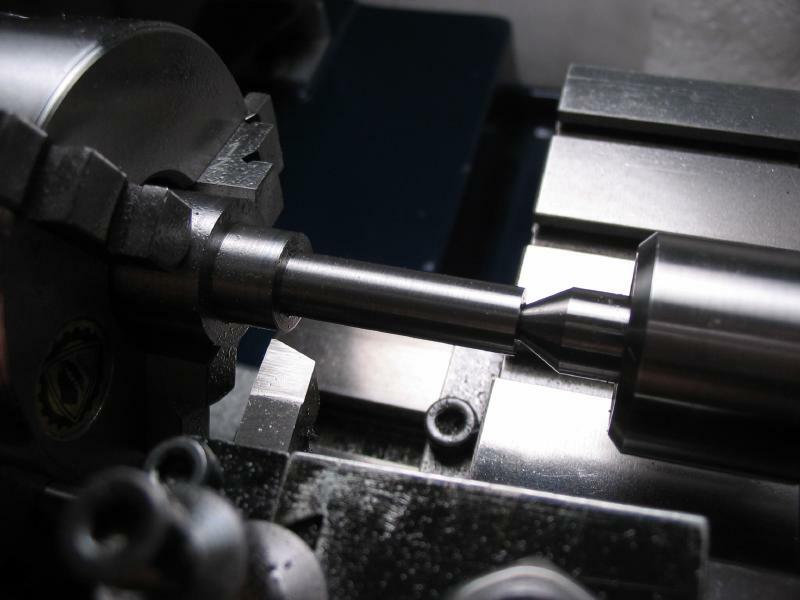 Reduced to 12.5mm, and then to 8mm. 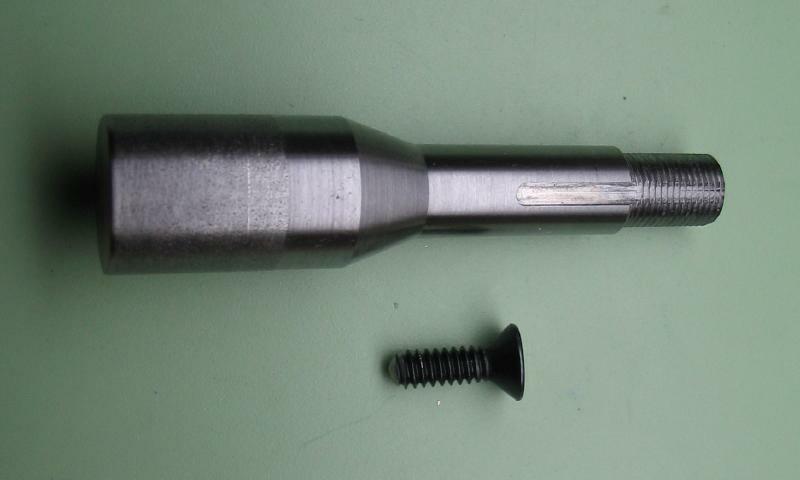 The 8mm body of the shank is turned down, the portion to be threaded was then turned to 6.85mm, and then the 20 degree angle can be turned using the compound slide. 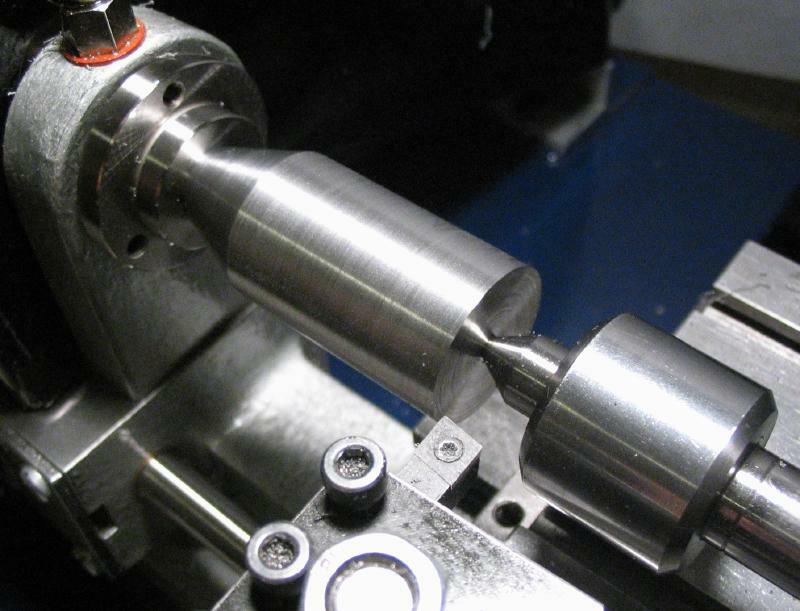 The threads were formed using a B8 die in the tailstock die holder. The milling spindle was setup on the cross slide. 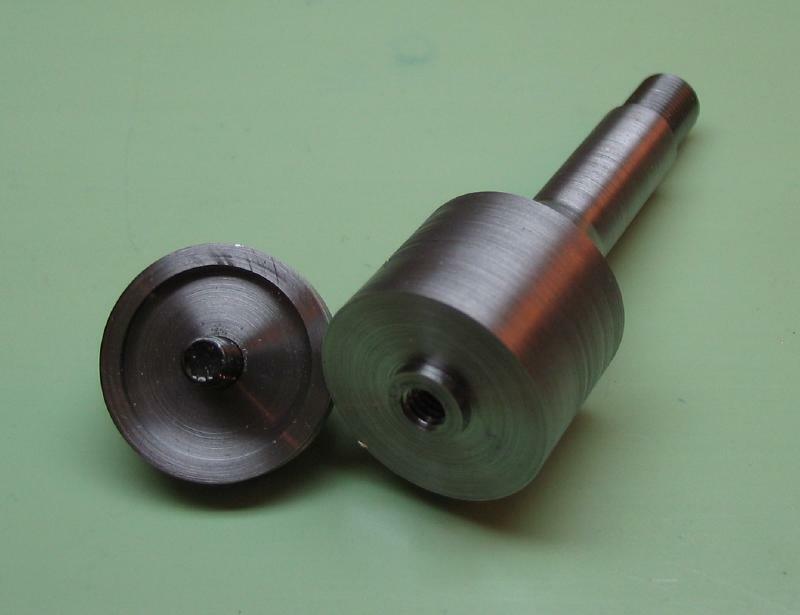 The centers were used in the spindle and tailstock to bring the mill on center. 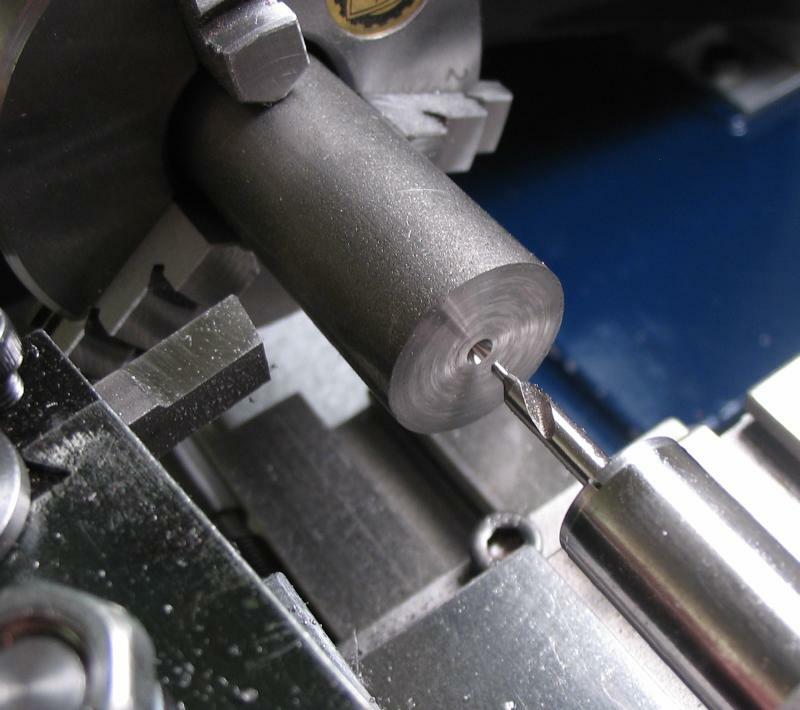 A 2mm endmill was used to form the keyway in the side of the shank. 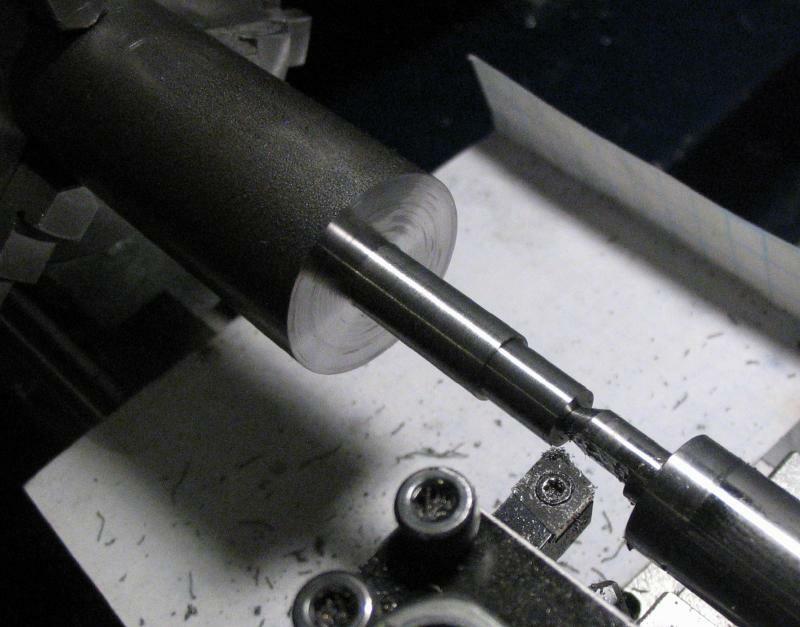 The arbor can then be mounted directly in the headstock using the drawbar. 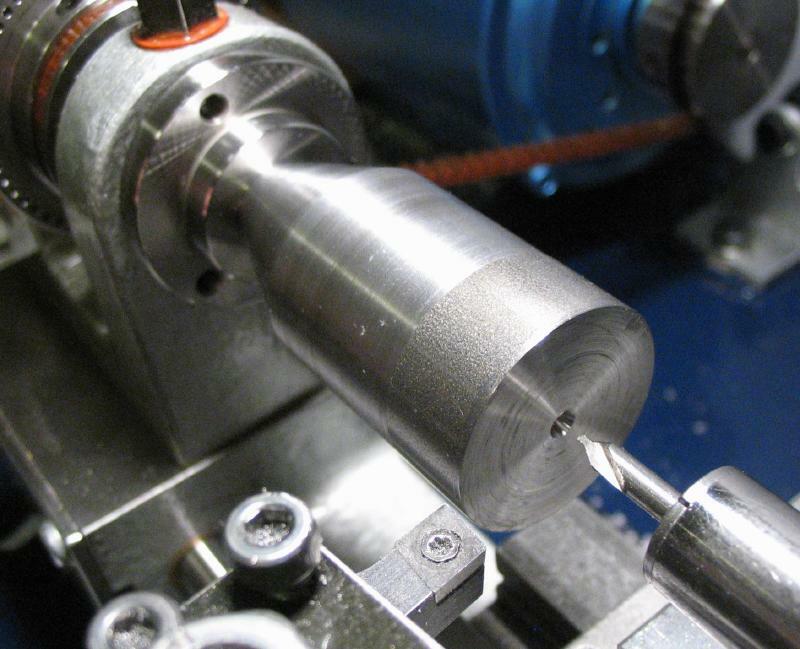 The final diameter of the arbor head was turned, followed by another facing cut. 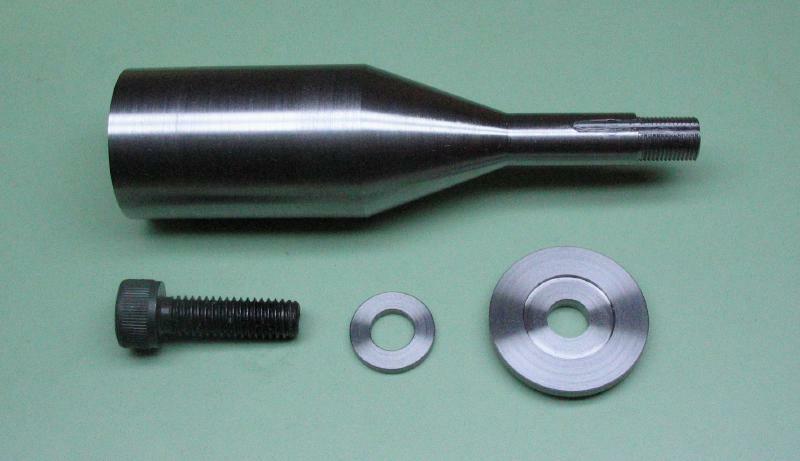 The arbor was drilled 3.2mm, and tapped with a M4x0.7 tap. Finally the actual 1/4" arbor to hold the saws can be turned. 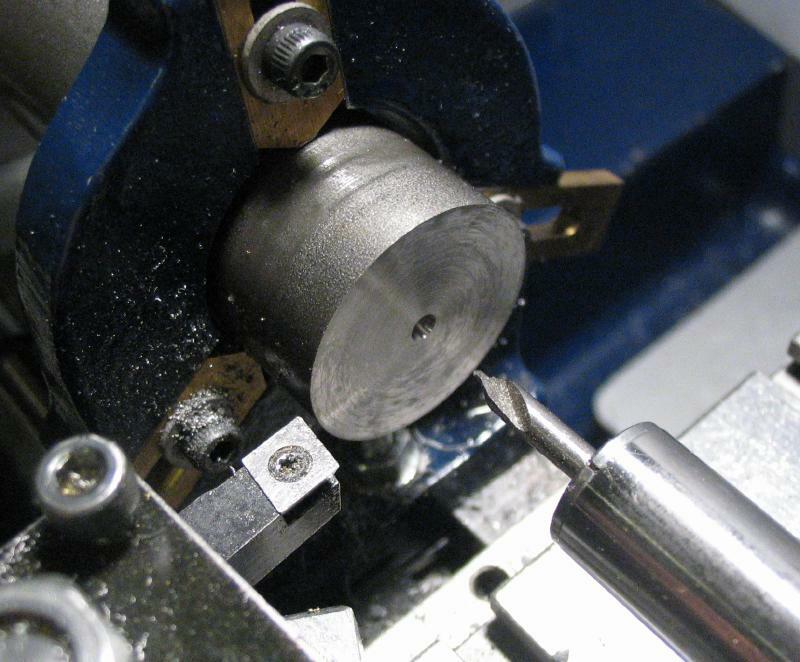 To secure the saws to the arbor a washer was made from the same 3/4" steel rod. 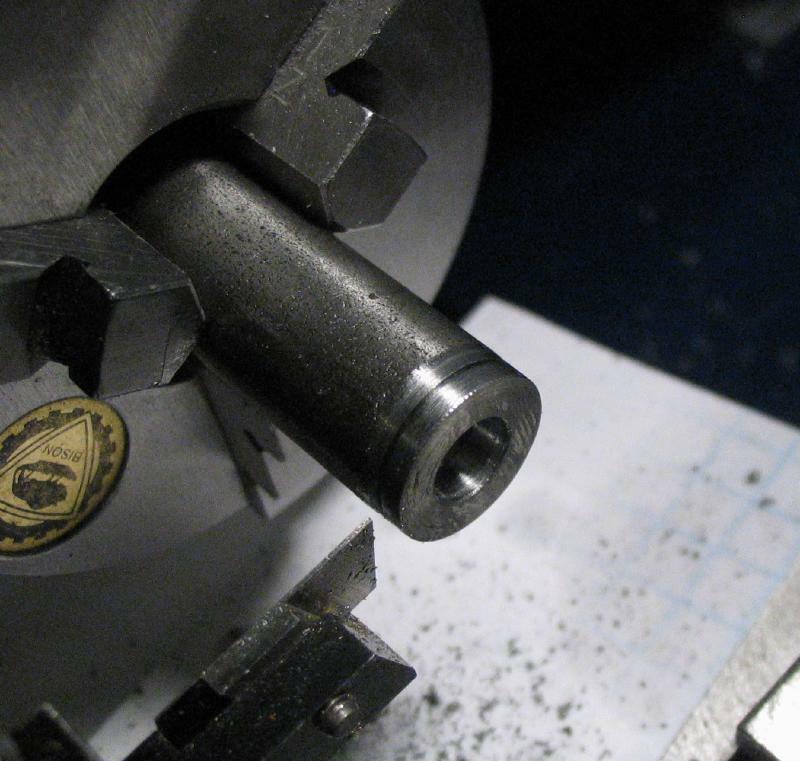 A small section (from the scrap box) was faced and drilled 4mm to clear a M4 screw, and then bored. The boring is so that the washer will only apply pressure in the outer diameter of the washer. This provides a much more secure and concentric fastening. The washer is parted off, reversed and faced. The saw table attachment for the Cowells lathe includes a saw arbor. 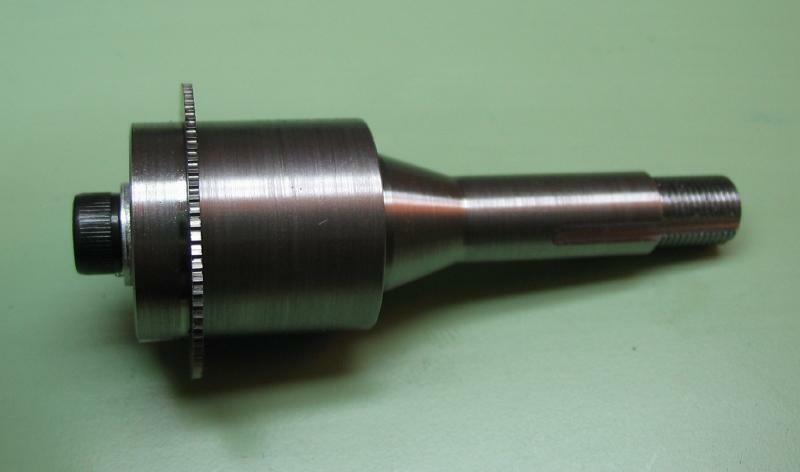 For the 90CW it has a collet shank and is 22mm in diameter with the mounting boss for the saw blade delivered unfinished. 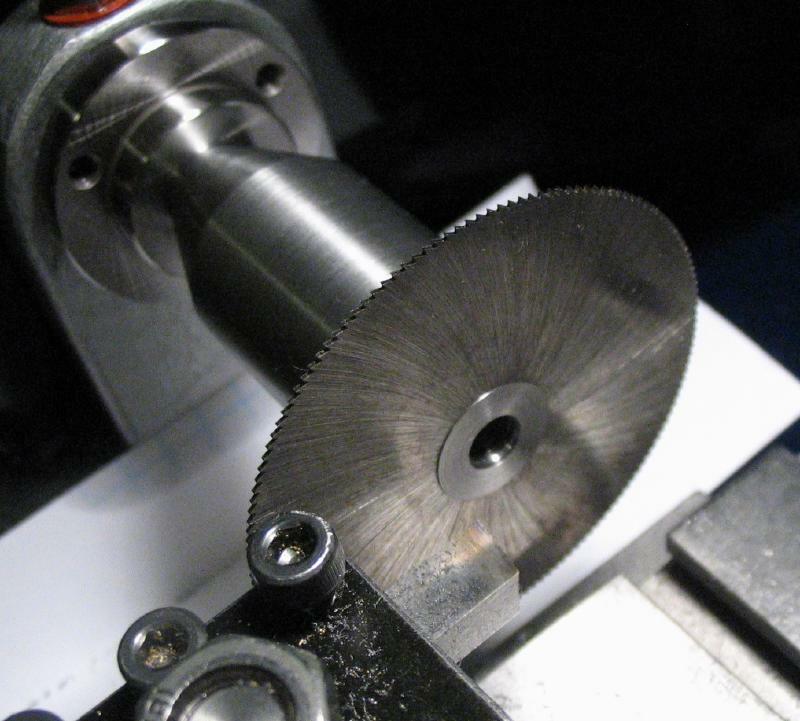 The arbor is provided with a choice of three thicknesses of saw blade, which are 63mm (about 2.5") in diameter with a 16mm bore, so I finished the Cowells arbor to fit the 16mm bore. 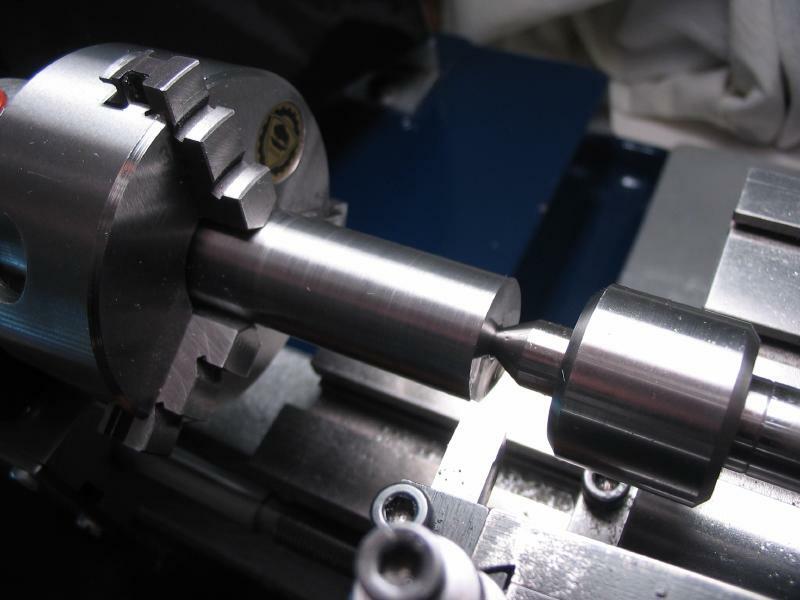 However, this metric bore size is not common in the US, and I decided to make a similar arbor that fits a 1/2" diameter bore, which is a more common size. The arbor was started from 1" cold roll steel rod (12L14) although 7/8" would require less turning, however I had some 1" rod already on hand. 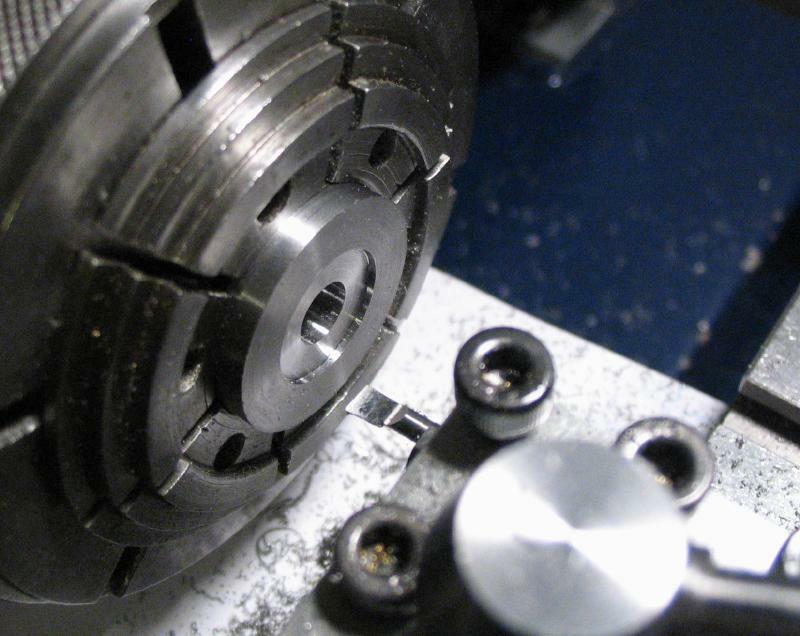 About 90mm was sawed off and mounted in the 3-jaw chuck and the steady rest used for support to face either end. One end was also turned down to 23mm for about 5mm. I decided to make this arbor a little larger than the Cowells arbor (23 vs. 22mm). 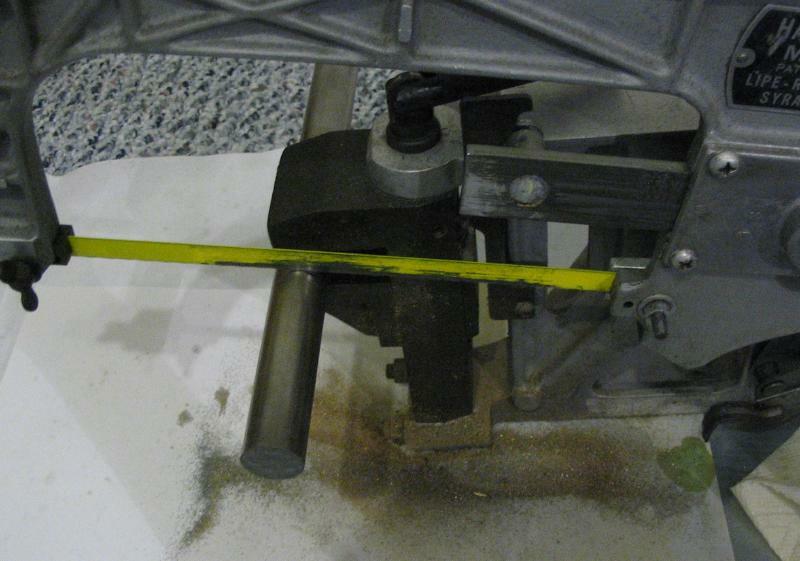 The rod was moved back to the power saw to cut off the turned portion. This cut off was put aside for now, but will be used to make the washer later. 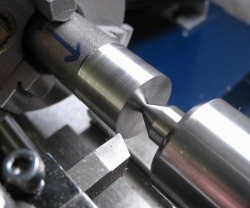 The rod was returned to the lathe to reface the parted end and be center drilled. The steady rest can be removed and the work supported with the tailstock and a center instead. 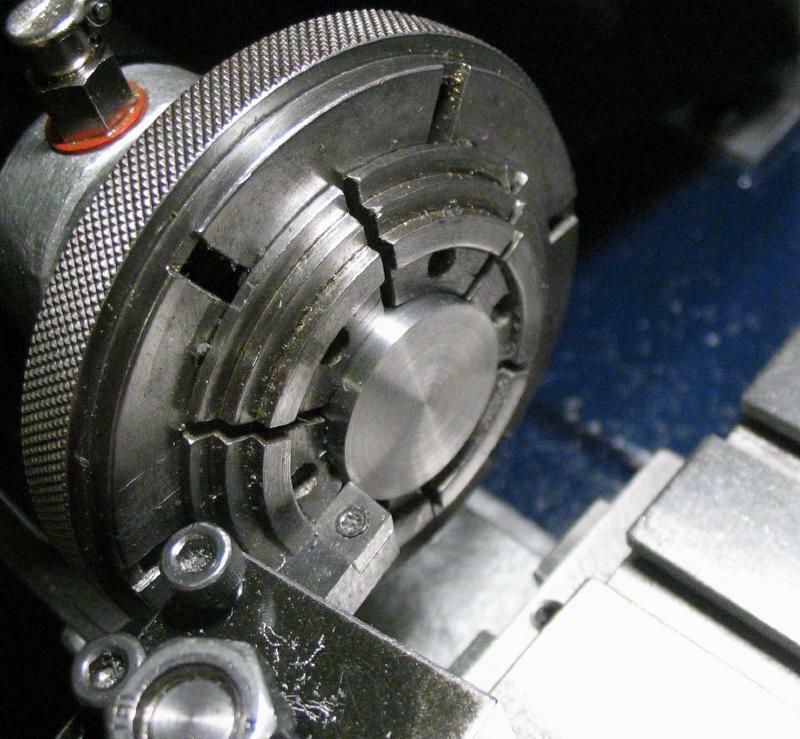 The rotating center was used for as long as possible, but a smaller center is needed for the last couple millimeters of turning. 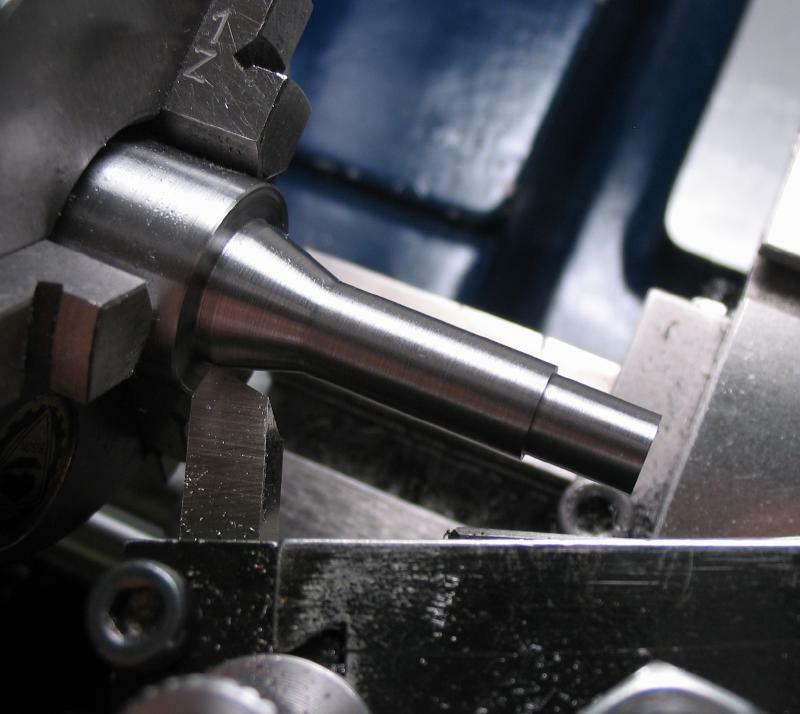 The rod was turned down to produce the collet shank as for the saw arbor described above. 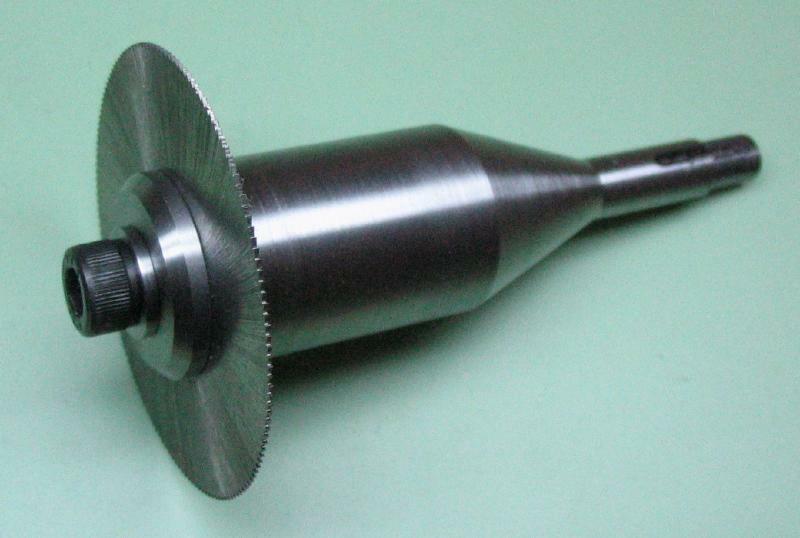 To turn the 20 degree taper, the steady was used for support since the tailstock could not reach. 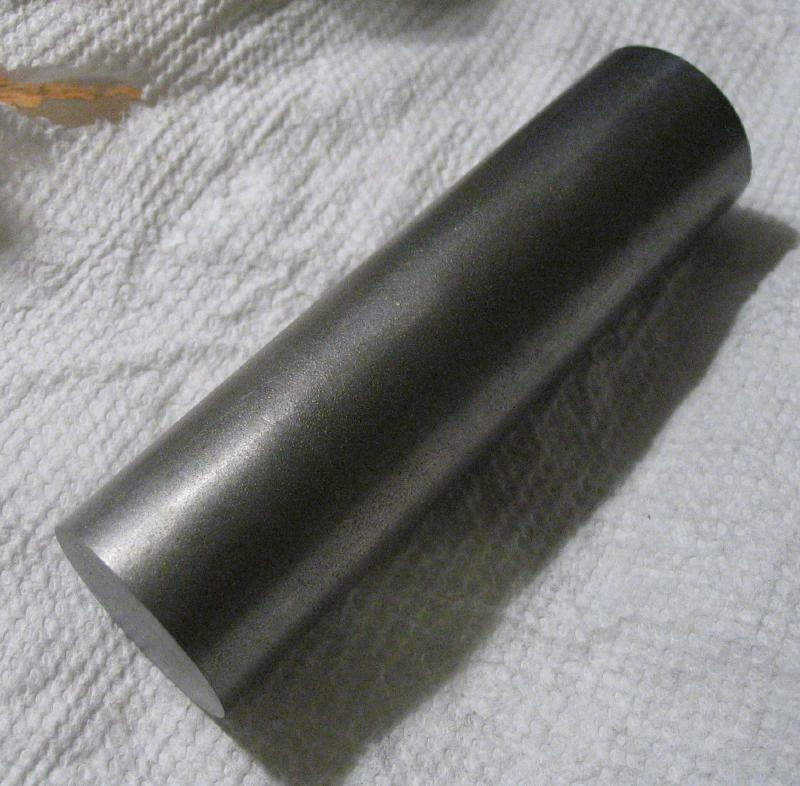 The rod was turned beforehand to give a true surface for the steady rest. The B8 threads were added with die in the tailstock holder. 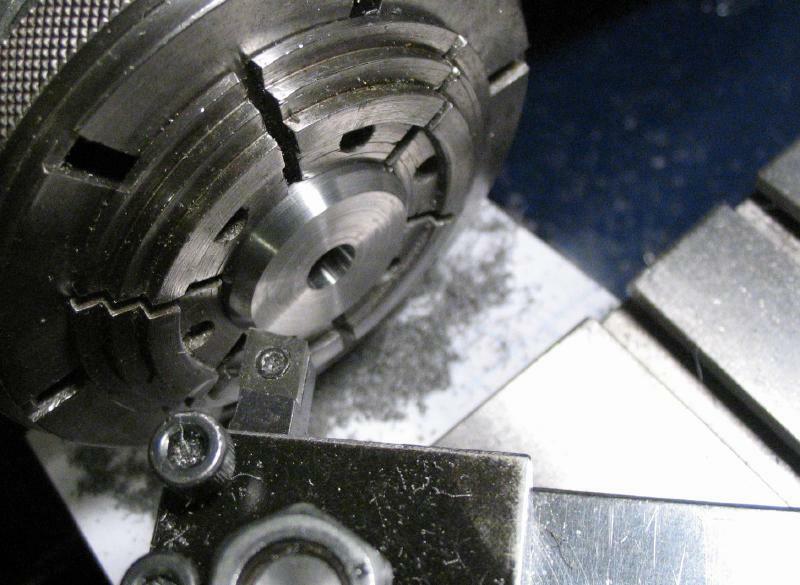 The work was finally removed from the 3-jaw chuck and moved to the vertical slide for milling the key way. 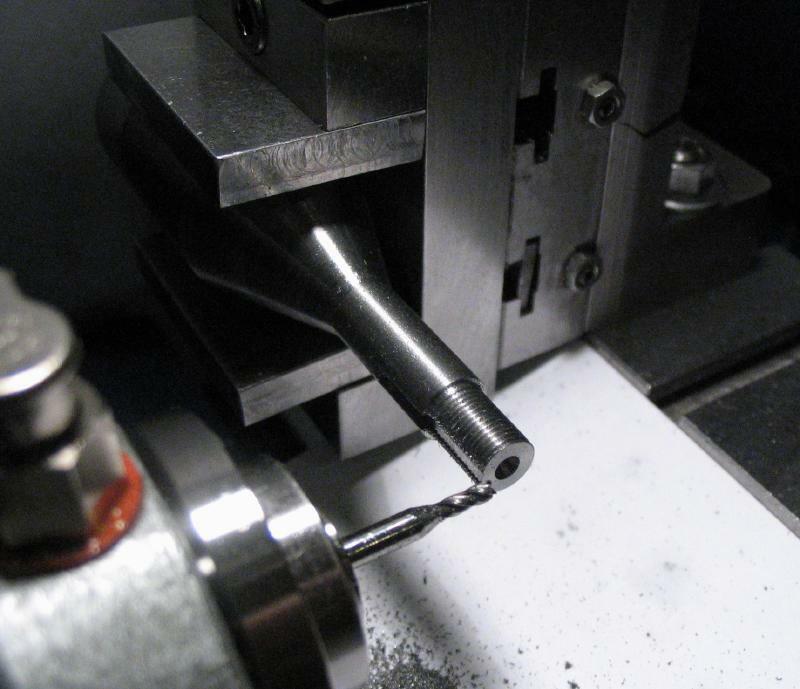 The work is centered and the keyway was milled with a 2mm endmill to a depth of 1mm. 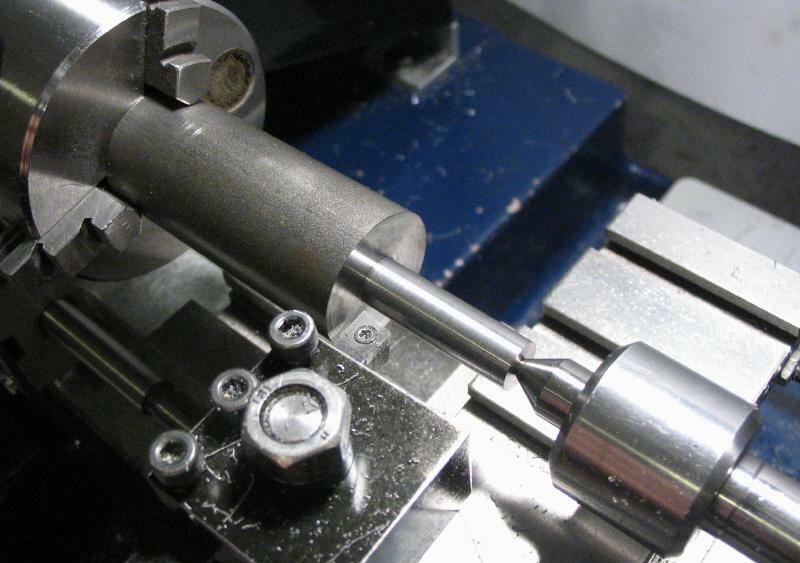 The arbor can now be mounted directly in the headstock spindle and fixed with the collet drawbar. 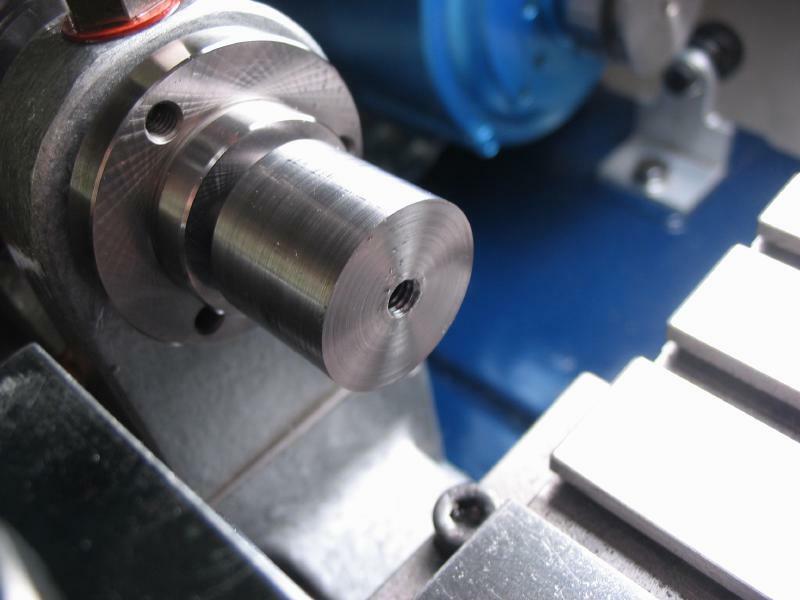 It was faced and center drilled, and with tailstock center support, the arbor was reduced to 23mm in diameter. 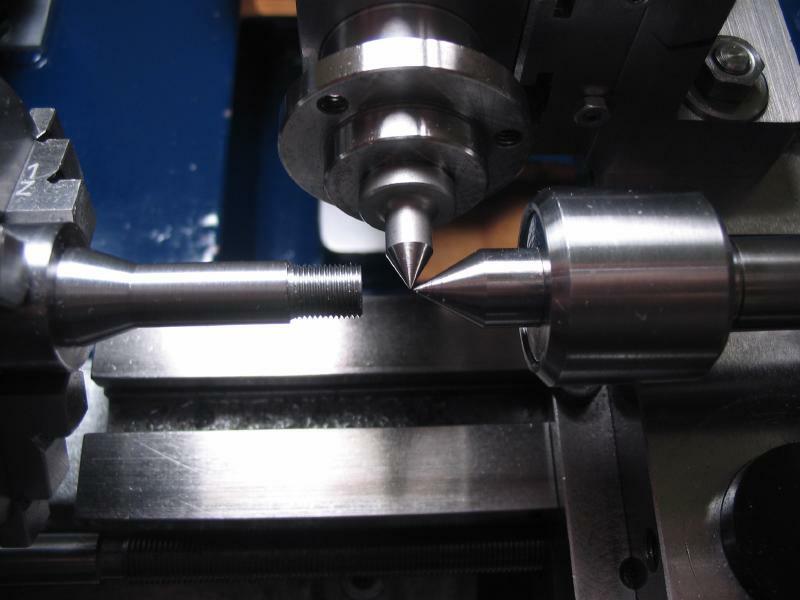 It was then drilled 5mm and tapped M6x1.0mm. 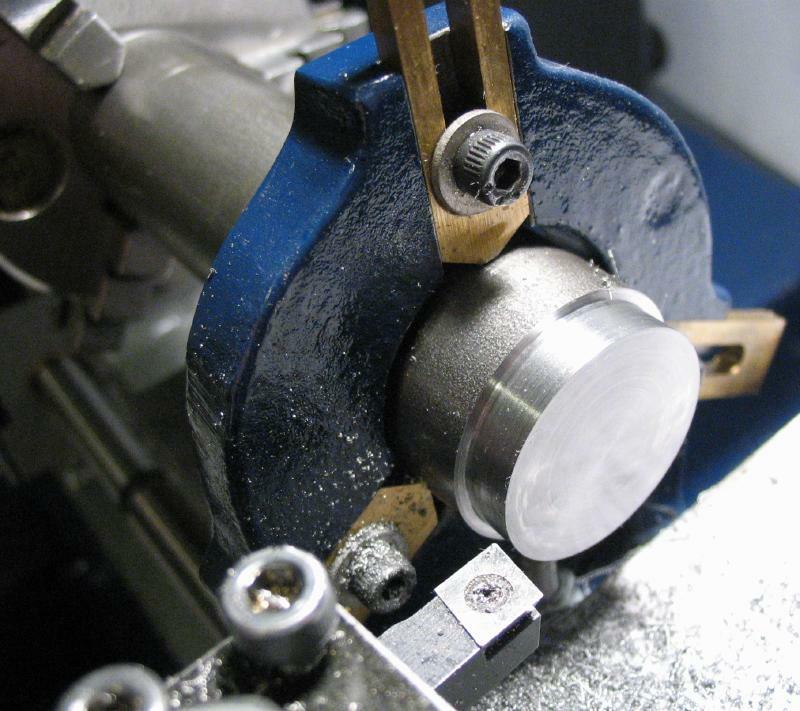 The disc that was parted off earlier was mounted in the six-jaw bezel chuck to face the parted side and then drilled 6mm. 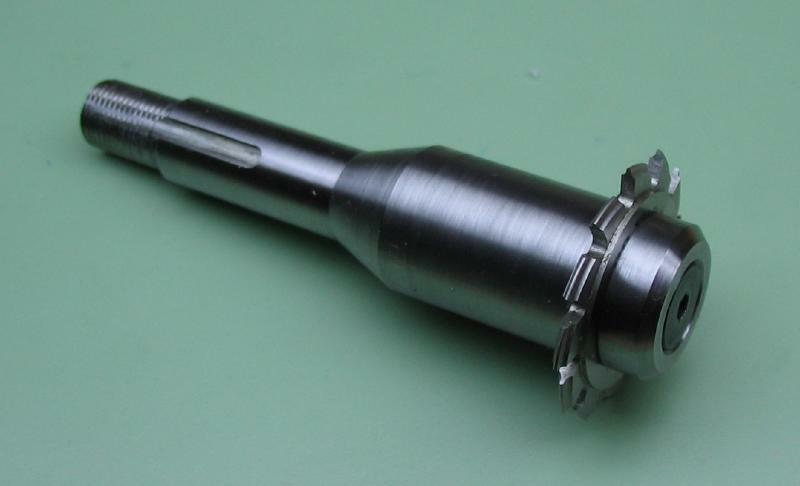 A small boring bar was used to bore the hole open to 6.25mm (to slip fit the screw) and counter-bored to a diameter of 13.2mm (1/2"+0.5mm) and a depth of 0.6mm in order to fit the saw mounting boss on the arbor. 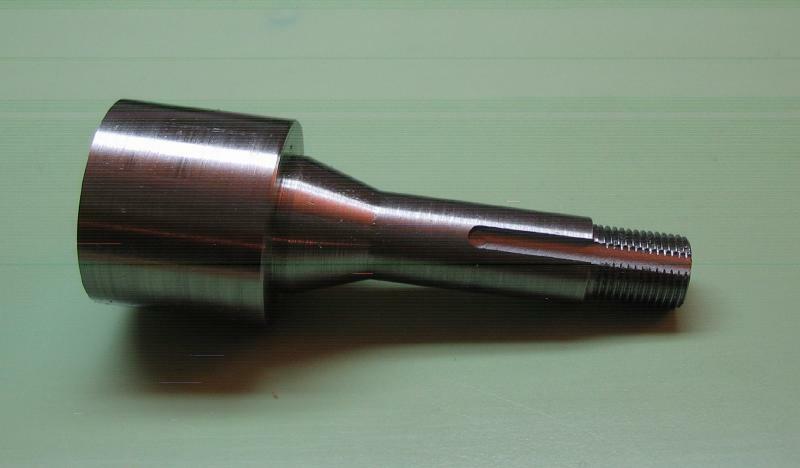 The compound slide was used to lightly chamfer corners to removed burs and after reversing disc in the chuck, the opposing face was returned, the hole countersunk, and the outer corner given a generous 45 degree chamfer. 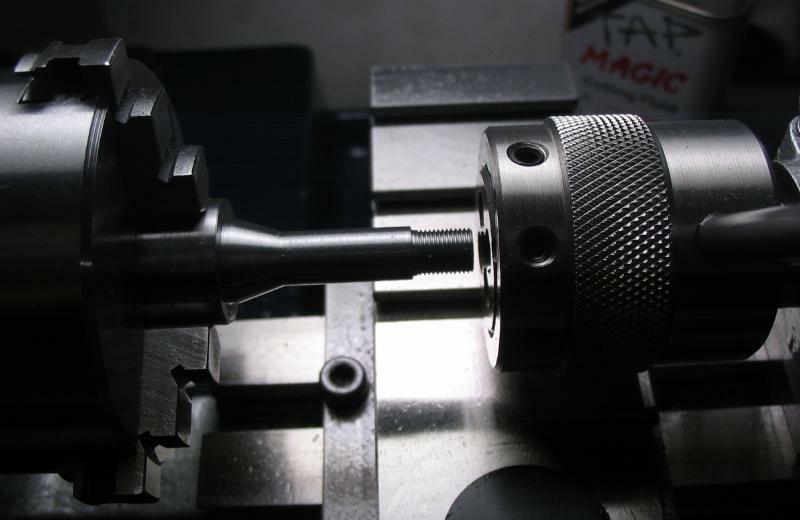 Not having any stock M6 washers on hand, one was made up on the lathe from 1/2" cold roll steel rod. 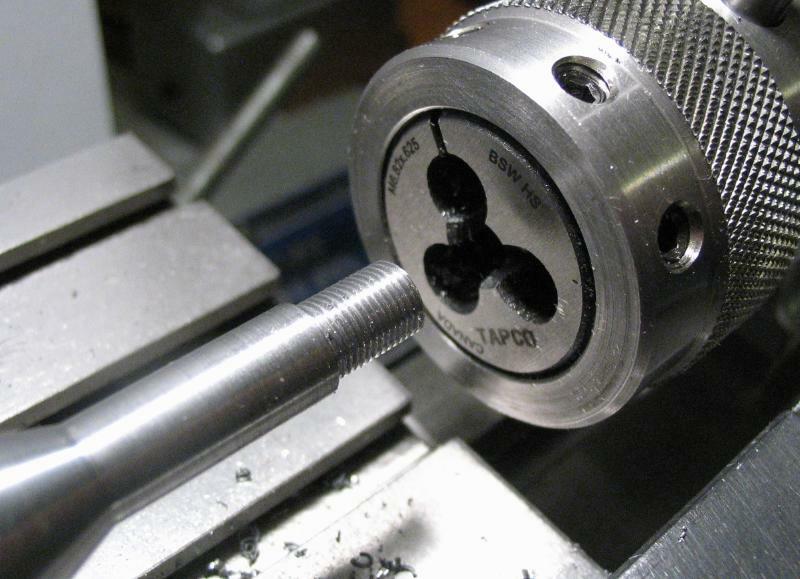 It was faced, turned true, and drilled 1/4" to give a free fit to the M6 screw. Corners were deburred with a countersink and needle file, and the washer then parted off at a thickness of 1.6mm. The arbor was then turned to fit the bore of a saw. 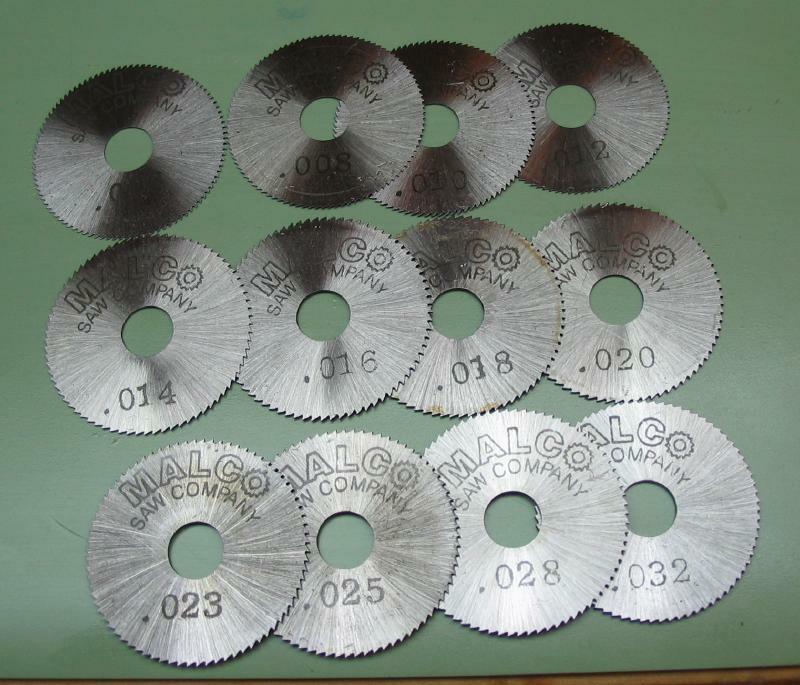 Shown is a 2" diameter Malco slotting saw (0.020" thickness) with a 1/2" bore. 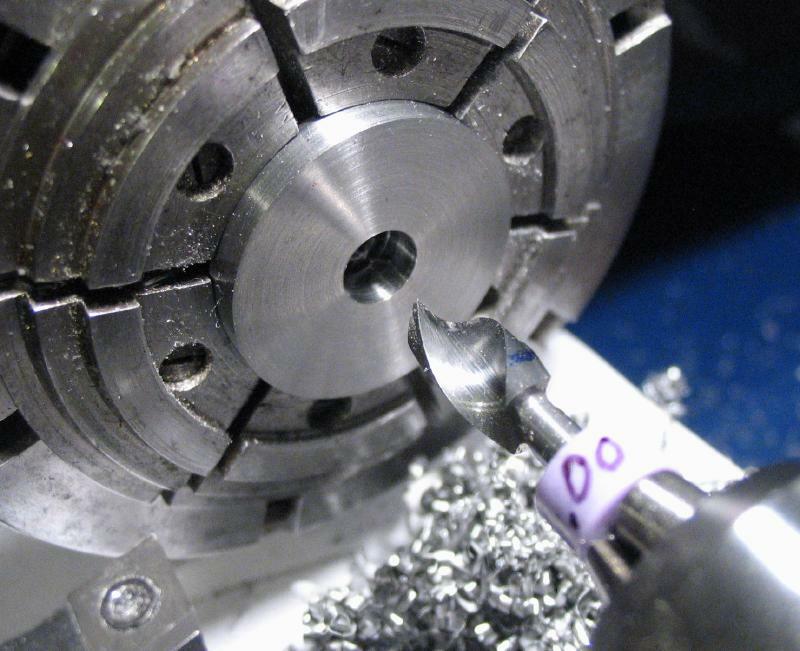 A sharp lathe tool was used to ensure the saw seats properly, i.e. no radius in the corner. 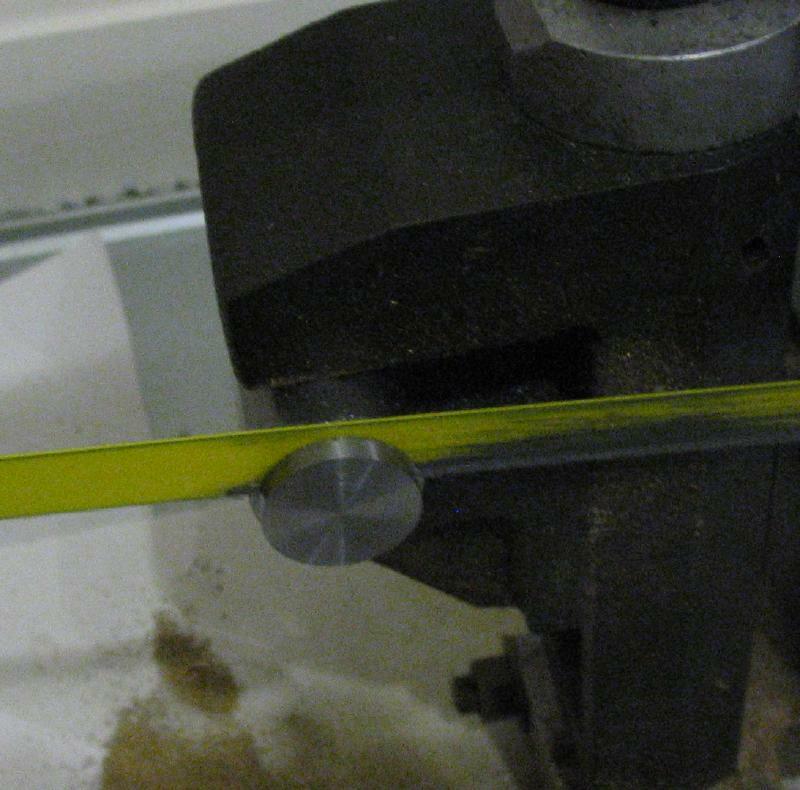 The saw itself was used to test the turning progress. Once a good fit to the saw was found, the arbor is complete. Using the same basic design, an arbor was made to hold P.P. 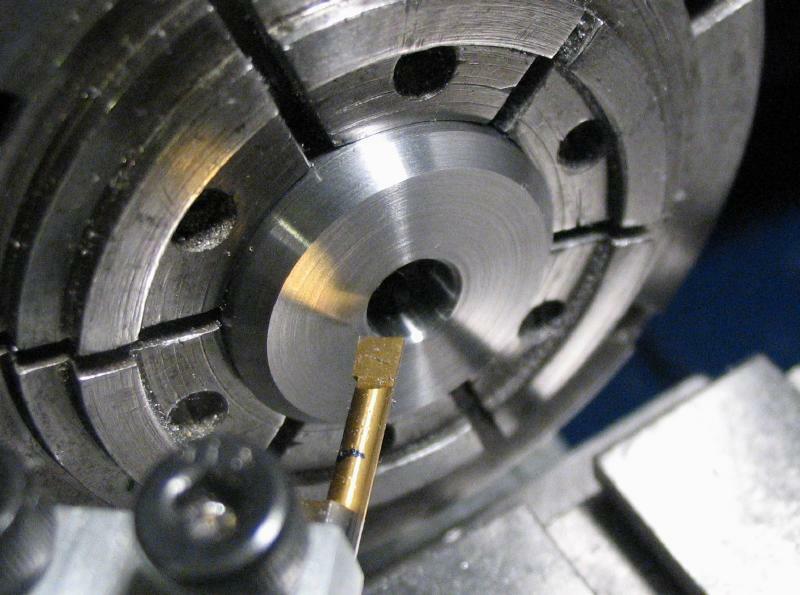 Thornton wheel cutters (7mm bore). 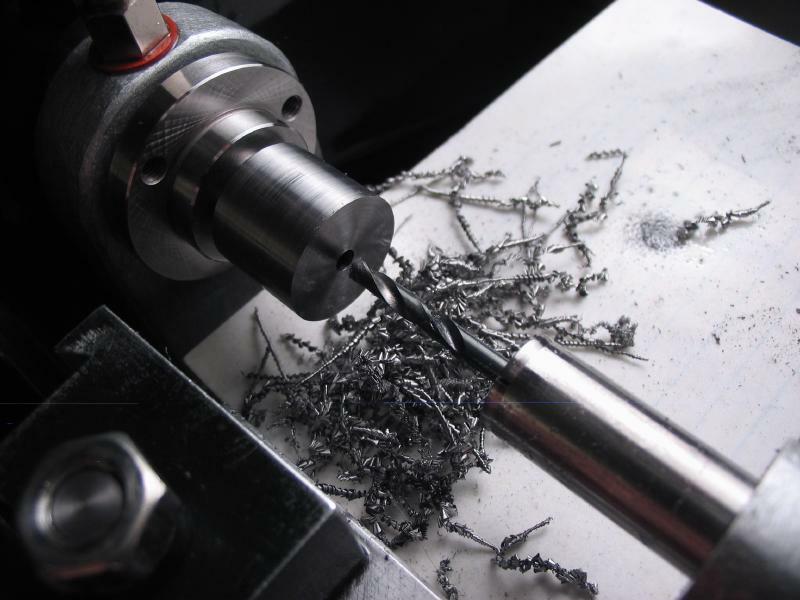 It is made from 1/2" cold roll steel rod and fit with a countersink head screw (#6-32 threads). 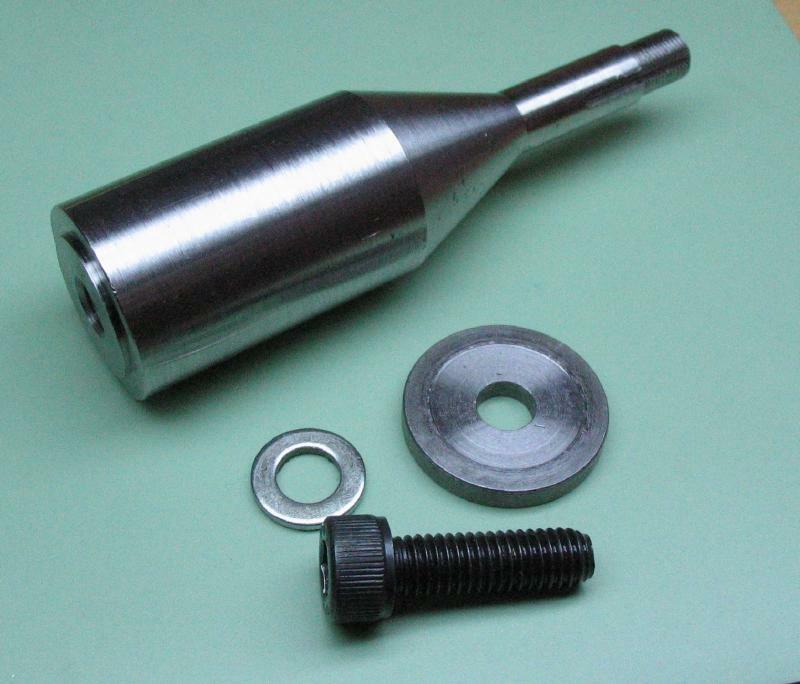 The washer was made from the same steel rod and bored 82 degrees to match the screw head. 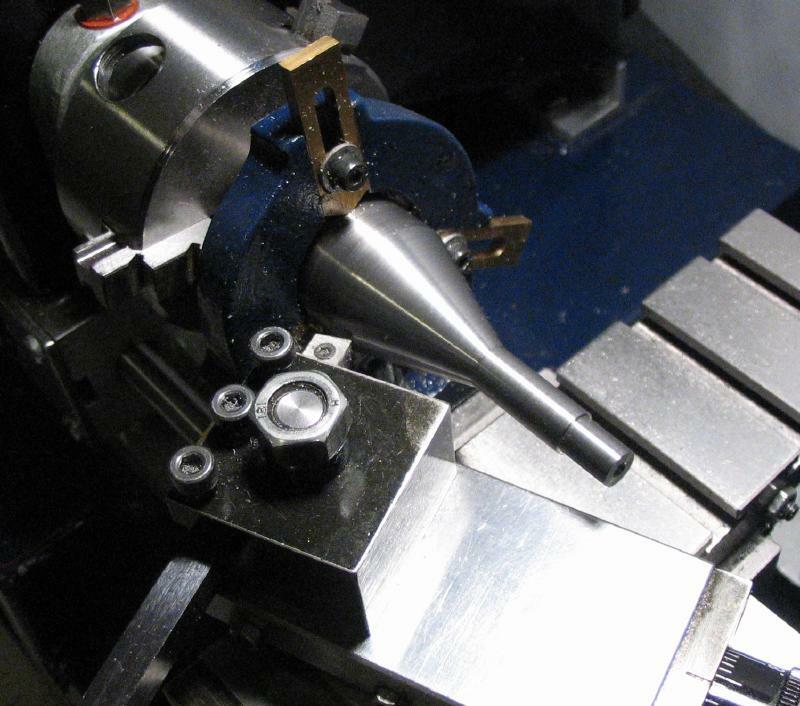 After forming the collet shank.